Did you know that today is National Pumpkin Day? I didn't either until a couple of minutes ago! Good thing I had this post in my drafts waiting for the perfect opportunity to share with y'all! On a recent trip to Walmart, Grace added a jar of Halloween sprinkles to our shopping cart. I love when Grace "shops" when we're at the store. It's interesting to see what she thinks we should be purchasing! Like a couple of weeks ago when she added a huge tub of chocolate chip cookies to our cart. Joe put them back because Grace doesn't eat chocolate chip cookies! She probably figured mommy needed a chocolate fix! Anyway, back to the sprinkles. I'm not sure why I didn't put those sprinkles back on the shelf, since I really don't bake. I always have good intentions wanting to make cookies or cupcakes for Grace, but I never seem to get around to it. I don't enjoy baking very much. I can't decide if it's due to laziness (all that measuring) or if it's because of my ancient oven that makes everything look over-done. That doesn't even take into consideration the fact that my daughter only likes cupcakes from the super-market bakery. A couple of weeks ago, I shared a Three Ingredient Pumpkin Spice Cake recipe that's right up my alley! So simple and no measuring! It at least solves the laziness part of my excuse for not baking! Soon after, I saw that Shelly from Cookie & Cups posted an easy 2-ingredient brownie recipe! I LOVE brownies! After reading her post, I was extremely interested! Especially when I saw that one of the ingredients was a can of pumpkin! 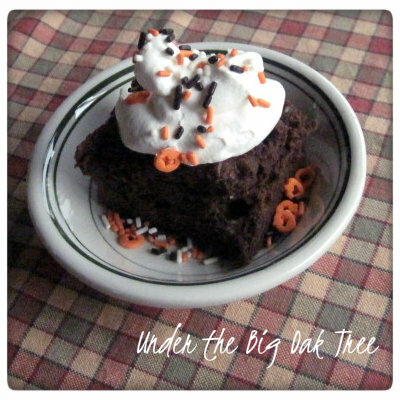 Now, I've tried a couple of different cake mix varieties mixed with canned pumpkin, but never even thought of trying to use brownie mix combined with the pumpkin! What a great idea!!! I couldn't wait to try it! Shelly's recipe calls for the family size box of brownie mix. The box that you prepare in a 13x9 pan. I didn't have that, so I used 2 pouches of the regular sized mix. The size that would bake in an 8x8 pan. Of course, I had to add a third ingredient to the brownies! Chocolate chips! Usually, I add ingredients to recipes because I just can't leave well enough alone! This time, it was more out of necessity. You see, I only had a handful of chocolate morsels left in the bag and if I didn't add them to the brownies, I'd have eaten them all myself. Right out of the bag! So, to save myself, I distributed them evenly throughout the tray of brownies that I ate almost all by myself anyway! Oh well! I tried! Lightly spray a 9x9 baking dish with cooking spray. In a bowl, mix together the brownie mix and canned pumpkin with an electric mixer until well combined. Add in chocolate chips and mix until evenly distributed. Spread mixture into greased baking dish and bake in oven for 30-40 minutes. Brownies are done when toothpick is inserted in center and comes out clean. As you can see, I decided to top my brownie with some cool whip and sprinkles for a festive look, but believe me, these brownies are perfect all on their own! While not exactly the texture of a true brownie, this recipe turns out perfectly moist and fudgy! Super yummy! I've done the pumpkin and cake mix trick before. Now I'll have to do with with brownies too! Yummy! I love pumpkin and I bet that gives just a nice hint of flavor and moistness that would be delicious! YUM! I love Pumpkin anything. PLUS brownies... WIN! You are making me want brownies and I can't have them! Lol. Thanks for sharing, I'm the same way... buy things and then never get around to actually using them! YUM! I love anything Pumpkin! PLUS brownies . . . WIN! LOVE these. They look delicious!! Yum! Looks delish! I love using pumpkin as a substitute! 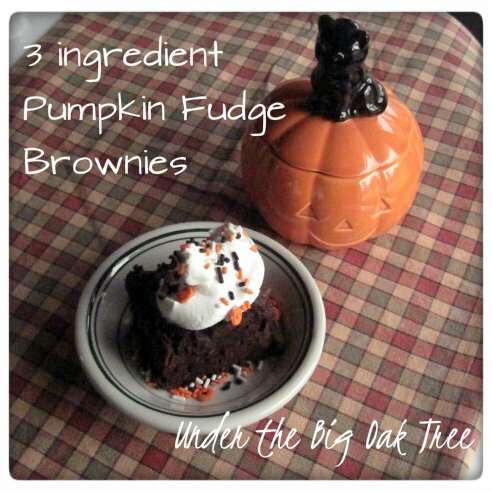 What a great idea to add pumpkin to the typical brownie recipe. I'll bet these were extra moist! Newest follower here! I found you through the Weekend link up! Cute blog, I can’t wait to read more!